In Saigon, there are similar complexes, but the prices will increase the deeper you get into downtown Ho Chi Minh City. For the rooms shown in this video, the rent prices range from $340/month (1 bedroom) to $800/month (2 bedroom, 2 bathroom penthouse). On top of rent, you can pay about $45/month for full maid service, including laundry. On the rooftop, there is a pool and some amazing views. For more information about this particular complex, visit their website. 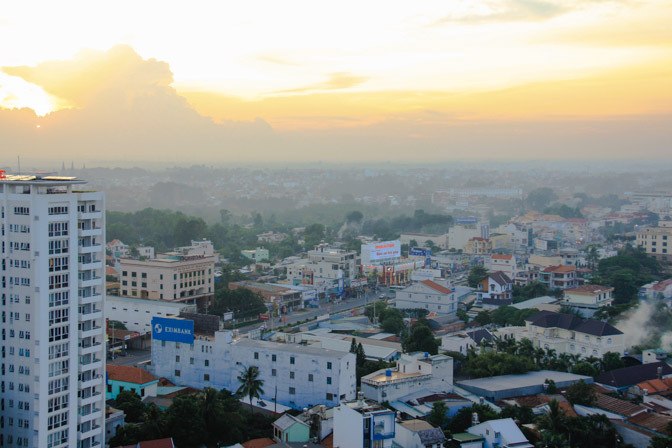 Thu Dau Mot, the capital of Binh Duong province.